I'll be reading at the Levantine Cultural Center tonight. Free to the public. Poets present starting at 8 pm. I will (finally) be giving my first poetry reading since becoming a mother. 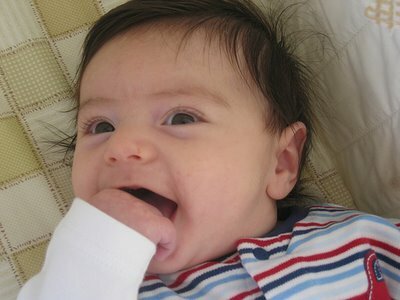 Diapers can't hold me back! The reading will take place on Tuesday, May 19, 2009 at 2 pm in 268 Commons (HUB), the Highlander Union Building (formerly Commons), on the UC Riverside campus in Riverside, California. Save the date! I'll be reading at California State University Los Angeles on Monday, November 10, 2008 at 6:15 pm. The reading will take place at the CSU LA Student Union, 5154 State University Drive, Los Angeles, CA 90032. 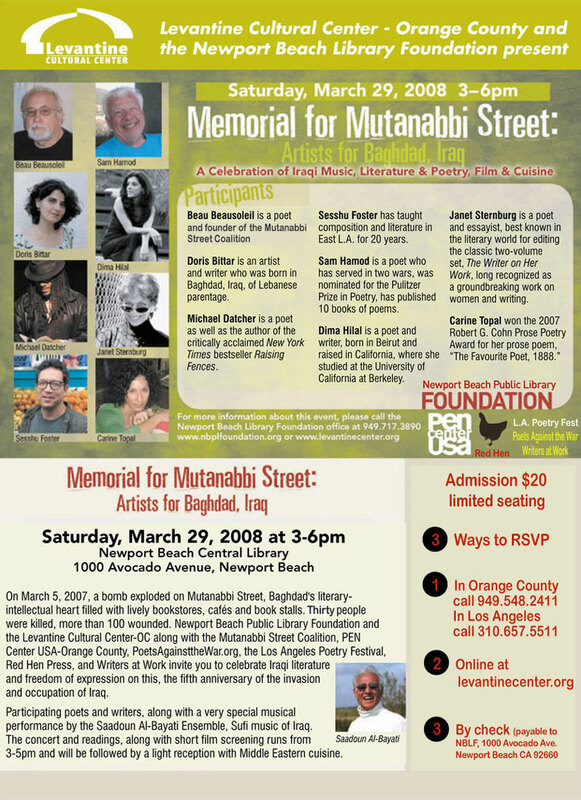 On Saturday, March 29, 2008, I'll be one of many performers to memorialize the destruction, a year ago, of Mutanabbi Street, which is Baghdad's literary and intellectual heart. The event will take place from 3-6 pm at the Newport Beach Library, 1000 Avocado Avenue, Newport Beach. 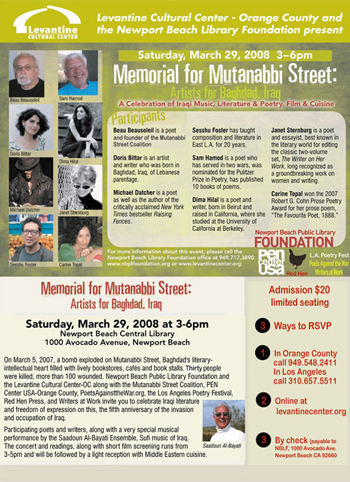 The event is sponsored by the Levantine Cultural Center, Newport Beach Library and the Mutanabbi Street Coalition, along with cosponsors Los Angeles Poetry Festival, PEN Center West, Red Hen Press and Writers at Work. To memorialize the blast's wounding of Baghdad's cafes and bookstores, there will be live music by the Saadoun Al-Bayati Ensemble and readings by Beau Beausoleil, Doris Bittar, Michael Datcher, Sesshu Foster, Sam Hamod, Dima Hilal, Janet Sternberg and Carina Topal. A short documentary of Mutannabi Street will be screened and the event concludes with a light Middle Eastern reception. Advance reservations are strongly suggested. Hope to see you there! For those in Orange County, call 949/548-2411 to RSVP. In Los Angeles, call 310/657-5511. Or reserve in advance now by donating online. Every few weeks, RAWI (Radius of Arab Writers, Inc) selects a poet to spotlight on their website. And I'm honored to be featured this go-around. Check out the poems while they're still up on this featured writers page. You can read four of my poems, including one I wrote for my darling nephew, whose photo is above. The Santa Barbara Independent published an article on the upcoming Women's Literary Festival, including a short interview with yours truly. You can read the article here. I'm quite honored to be part of a lineup of amazing writers who are being featured at this year's Women's Literary Festival in Santa Barbara: DIMA HILAL * JACQUELINE HIGUERA McMAHAN * KATIA NOYES * CAROLYN SEE * STARSHINE ROSHELL * ALISA VALDES-RODRIGUEZ * REBECCA WALKER * JACQUELINE WINSPEAR. This year's festival takes place on Saturday, February 24, 2007 at Fess Parker's DoubleTree Resort from 8:30 am - 3:30 pm. You can click here to register and find out more. "poem to you written in whispers" on YouTube!